Tulsa's News Channel 6 appears to have been fooled by a viewer-submitted photo that has now gone viral across the web. The picture claims to show a "melon-sized" hailstone that fell in Norman. There's just one problem. That is absolutely not a hailstone. Hail forms in thunderstorms when water freezes around a condensation nuclei such as dust or ice pellets. Thunderstorms have an air circulation system, if you will, comprised of rising air (updraft) and falling air (downdraft). Hail will rise with the updraft until it reaches a point where it is too heavy to continue to be blown upwards. During that time, it continues to pick up more liquid, which freezes around the hailstone. The more times a hailstone goes through this cycle, the larger it becomes. Supercell thunderstorms have updrafts capable of producing very large hail (baseball to softball size). If you take a close look at a hailstone, you will notice that it has layers, like an onion or tree. This is due to how it formed. Each ring roughly corresponds to a trip through the updraft system. Eventually, the hailstone becomes too heavy, and falls to the ground. Another thing that will happen with large hail, as you will see with the next picture, is that it will absorb other hailstones, giving it a rough and jagged appearance. Large hail simply is not as smooth as the photo above. That is what large hail looks like. The KOTV photo looks to me to be a frozen water balloon, and judging from the background of the picture, seems to have been a classroom experiment. Nevertheless, the photo was picked up by the Associated Press, the Drudge Report and others, and from there, it has permeated the web. But...... it's not not a hailstone. I would guarantee it. That's a frozen water balloon if I ever saw one! 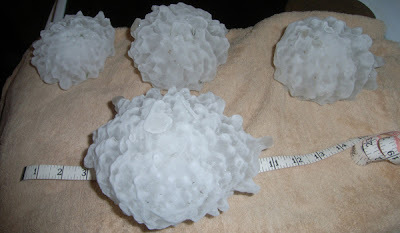 To me, I thought that there should be a picture of a whole bunch of 'melon' size hail, on the ground. NOT One... Anyone can take a picture of one so called large piece of ice. It didn't ring true to me. It seemed that reporting should have done real reporting with some real facts. A story is a story, but I was disappointed in Drudge just to get a 'story' and put this article out. That is the exact shape of a frozen water balloon and it cracked in several places in an interior-stress fashion just like a block of ice if you've ever seen a block of ice sit out at room temperature for awhile. It would also crack like that when being frozen as a whole freezing from the outside-in as opposed to a large hailstone which freezes from the inside-out in layers. There are other pictures of ice from freezing a water balloon on the internet and they have similar interior stress-cracks. Large hail is not smooth. Hail has ice-layers. When you review a negative of this image it looks exactly like the shape of a balloon even more so. We did not even have any hail in Norman. At least not on the west side. It clearly looks like a water balloon! !